20 Items to Remove from Your Life - Home Sorted! Do you want to declutter you home, but don’t know where to start? We’re not going to lie – the first steps are always the hardest! And it can be tricky devising an action plan. For this reason, we recommend starting slowly by decluttering these 20 items from your life. 1. Beauty products past their best before date – as a general rule mascara and eyeliner last 3-6 months after opening, foundation 6 months – 1 year, whereas powder-based products and lip products last 2 – 3 years. 2. Any item in your home past their best before date – go on, check the pantry! 3. Broken items – why keep items you’re not going to fix? 4. Clothes that no longer fit – this applies to the whole family! There is no use hanging onto items that will never be worn again. 5. Old newspapers or magazines – straight to the recycling bin! 7. Boxes for electronic items – if you’re using the item, do you need the box? 9. Mismatched kitchenware – if you can’t find the lid for your Tupperware, it’s time to get it out of your life. 10. Anything you don’t like – why keep items in your home if they don’t bring you joy? 12. Manuals and receipts for purchased items – if you don’t need them for taxation or warranty purposes don’t bother keeping them. Nowadays electronic manuals are all available online anyway. 13. Old electronics – are you really going to use that ancient flip phone? Or desktop computer? 14. Medicines past their best before date – it’s a health risk you should never take. 15. Old greeting cards – are you ever going to look at them again? 16. DVDs/CDs/VHS tapes you never touch – especially if it’s not something you regularly watch, or you don’t have a devise to play them on. 20. Old school books or notes – if you’ve got the degree, you don’t need the source material. 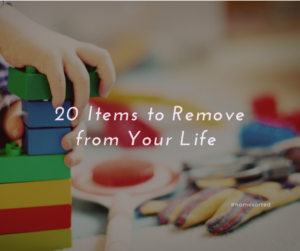 Are you ready to remove these items from your life?